Synopsis: “Jon (Jay Chou), an International Security Affairs agent unites with his elder brother (Nicholas Tse) to stop an international blackmail to release a deadly virus” (GSC Movies). 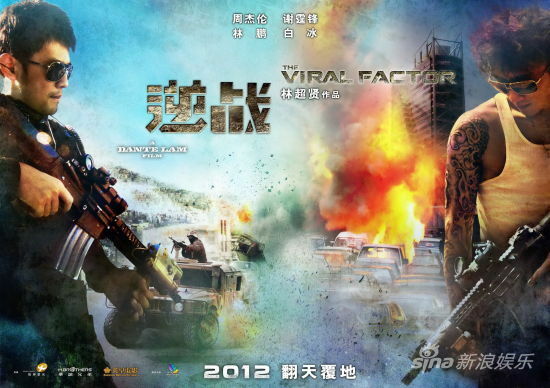 Verdict: The Viral Factor is perhaps one of Dante Lam‘s better works but definitely one of the worst written high budget Hong Kong action films I’ve ever seen. It’s like they took a familiar plot and made it worse and more unrealistic than it already was. The only thing that makes sense and is realistic in the movie is how incompetent and corrupt the Malaysian police are. Not just the plot, the acting of the non-veterans are horrible as well. I thought Nicholas Tse (as Man Yeung) did a great job, until the second half of the film. The action scenes are vague, except the unimportantly emphasised explosions and car crashes, and some of them are so ridiculous, I burst out laughing. Second opinion: “Touching story but with many laughable scenes; Sean (Andy On) is hot” (Iris Loong). i think you need to re educate "siri" haha. How many of his albums sold = the ticket box office x 2 (because no one would just go alone to watch this movie). caught this in the cinema and did enjoy it. but i felt the filming in Malaysia was a badly done. It made no sense of the locations and of course the cop. Such a fancy cop eh?